The Autism Spectrum is a set of conditions that affect how an individual interacts with the world around them. For parents with autisitc children, these differences can be frustrating, no matter what end of the wide spectrum the child may be on. On the flip side, small breakthroughs can be extremely rewarding, which is where projects like Passive Play come in. Passive Play is the brainchild of university student Tom Kirkman. As part of a final-year project at the University of Dundee in the UK, Tom developed the toy to help establish better connections between parents and autistic children, and raise awareness of the condition. "I'm a father myself, so autism is something that I worry about... I couldn't imagine what it would be like to go through finding out your child had been diagnosed. You [miss] that bond you have with your child, as autism affects the way a person communicates and relates to other people." The Passive Play project consists of an interactive toy cube and an iOS app. The child uses the wooden cube, which is designed to stimulate their senses (many with autism are sensitive to light, sound, and touch). The different sides of the cube all have a button that will start an exercise when pressed; these exercises range from playing music to learning letters and numbers. Parents can also record their own voice for the cube to play back to help the child feel more secure as they use the toy. "I hope to evoke the emotional connection that the parent may have... never had, and make them feel less isolated and more involved in their child's learning." In the meantime, the parents can use the app to monitor the child's interaction with the cube--it stores a various types of data, so parents can see which activities their kid likes the most, how many times the child uses it, and so on. Most significantly, the data can give parents an indication of which methods of learning will work best for the child. As Tom puts it, "By doing this I hope to evoke the emotional connection that the parent may have lost or even never had, and make them feel less isolated and more involved in their child's learning." Tom carefully crafted the toy to make it particularly tempting for autistic children to play with, from the smooth oak finish to the way in which the box lights up. "I have done a little bit of user testing with my own daughter, and something that I picked up on when she was playing with it was that it was so intuitive. She knew exactly what to do even though she had never seen it or played with it before." Of course, Passive Play was only developed as a university project, but Tom feels that if he was to go further with the project, he would test it further with autistic children, and try to find other ways to help them interact with the world. 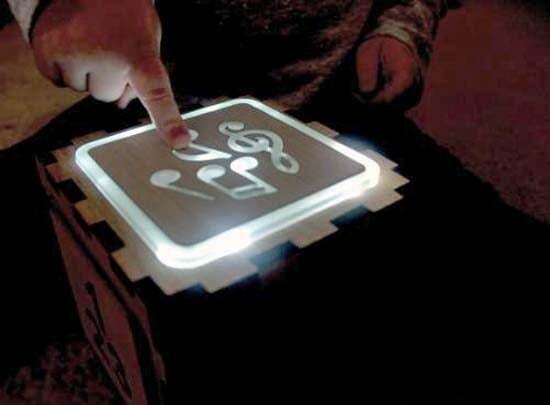 Projects like Passive Play are great examples of how technology can give people greater insights into those that may seem harder to connect with, or vice versa. Passive Play may not be the answer to all communication issues that arise between autistic children and their parents, but it's a start. Through it, neurotypical parents should be able to gain a better understanding of the way their child sees the world. All thanks to data shared between an app and wooden cube. If you are in the UK, Tom's work will be on display at the University of Dundee Degree Show between May 19 and 27.